Welcome to this latest collection of fused dichroic glass pendants, handcrafted by Sedona glass artist Karen Puckett. 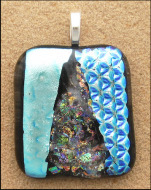 A dichroic pendant is becoming the "accessory of choice" for ever increasing numbers of American women. Each fused glass pendant in this collection is one of a kind --- when they are gone, they are gone! Fused pendants created from dichroic glass are magical magnets of color and dancing light, and are an easy way to add wearable glass art to your dichroic jewelry and accessories wardrobe. You will be stopped frequently, and asked: Where did you get that dichroic pendant?" All bails are either gold plated or silver plated. All pieces are sold as shown. NEW: Back by popular demand. We are once again offering dichroic pendants set in both Sterling Silver and Brass bezels. Click on any image or title for actual dimensions and a more detailed view.